Processing Creativity: Death is the beginning ? Death is the beginning ? I read it somewhere so I though I should share it with you all. As soon as you die, your identity becomes a "Body". People use phrases like "bring the body", "lower the body", "take the body to graveyard", etc. People don't even call you by your name whom you tried to impress whole life...Live a life to impress the creator not the creation. Take chances, spend money on the things you love, laugh till your stomach hurts, dance even if you are too bad at it. Pose stupidly for photos. Be child-like. Moral of the whole thing is Death is not the greatest loss in life.....loss is when life dies inside you while you are alive. Celebrate this event called LIFE. So, don't even think about what Death brings, is it a new beginning ? Maybe ! who knows but most important think is you are getting a chance to make a new beginning every day and to make the most of it...you have to live in this present moment and make the most of it. I love this quote of his Gaurab. 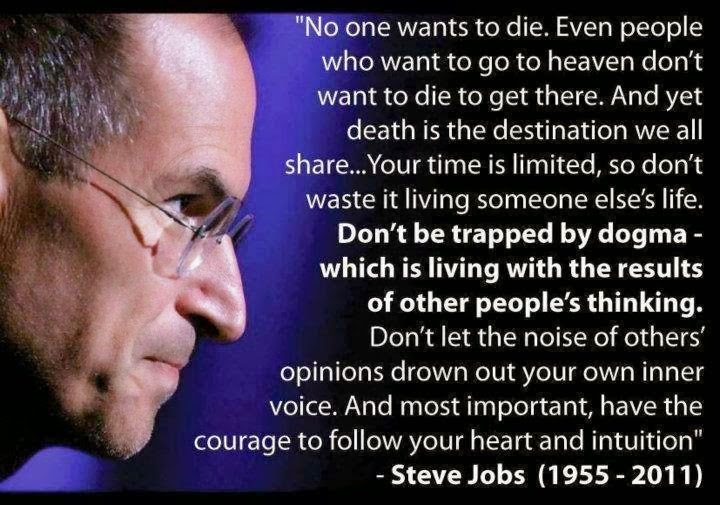 Esp his Stanford speech stands as one of the most amazing speeches ever delivered..
Death is the end as far as I know. I agree with your view that we should make the best use of this life which is the only one we may have. Superb Post. Steve job quote is highly motivational and you narrated it beautifully. Awesome quote! And so very true! Very true. Agree. Great quotes by Steve Jobs.